(February 12, 2008) — New York, NY —SonyBMG & SWAGRICULTURE present the next stage of the SAMPLOLOGY mixtape series, a mixed compilation of Hip-Hop and R&B heavyweights & the original blends that inspired their tracks. Each chapter highlights a select artist, producer or genre. 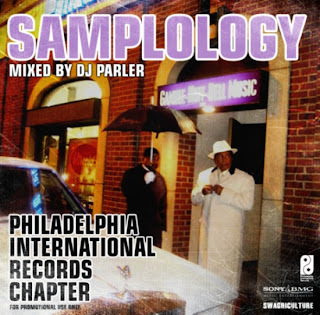 Recorded in the legendary Philadelphia International Records studios, DJ Parler along with hosts Kenny Gamble & Bunny Sigler present SAMPLOLOGY: The Philly Intl Chapter. This chapter covers tracks from P.I.R., the 1971 label formed by pioneers of Philadelphia soul, Kenny Gamble & Leon Huff. Mirroring the Berry Gordy & Motown Records movement, Gamble & Huff brought such R&B greats as The O'Jays, Patti Labelle, Harold Melvin & The Blue Notes, Teddy Pendergrass, Lou Rawls, Billy Paul to the musical landscape. To be released during Black History Month 2008, this February project is a testament to the impact and inspiration that the P.I.R. catalog has had around the world. It is also a predecessor to Gamble & Huff's induction into The Rock and Roll Hall of Fame in March 2008. "This compilation isn't intended to substitute the actual CDs nor thier samples," says DJ Parler. "But to complement the albums and excite those in search of good music. I'm hoping that after hearing my mixes, people will want to dig deeper." Additional SAMPLOLOGY Series include The K West Chapter, featuring material that Kanye West has appeared on as a producer and/or MC; The J Dilla Chapter, highlighting music produced by the late James Yancey a.k.a. J Dilla. And A Gangster Chapter, inspired by Jay Z's American Gangster soundtrack.